Dallas is shaking things up on defense after their recent struggles. 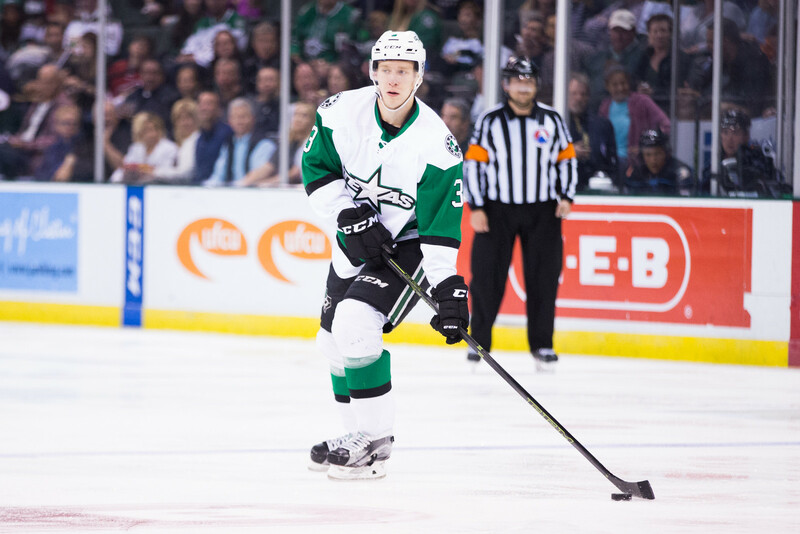 As was surely expected in the short term, Esa Lindell was recalled to Dallas after a tune up stint in Texas. 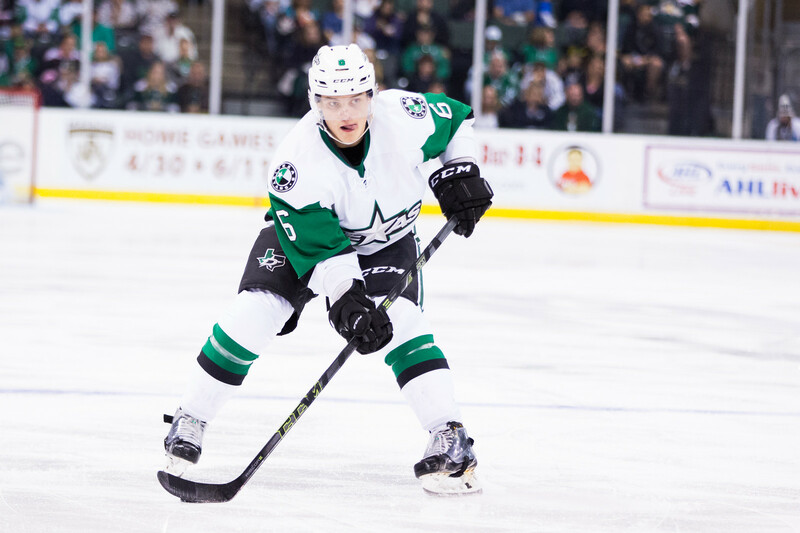 The unexpected move today was the recall of Julius Honka. It was his first NHL recall. Given the Dallas defensive issues, he may well play his first NHL game Monday. 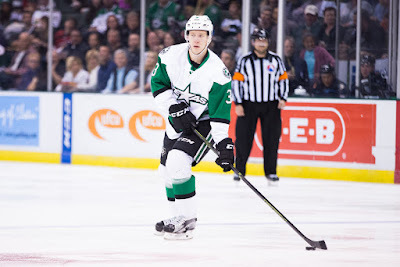 Dallas Stars General Manager Jim Nill announced today that the club has recalled defensemen Esa Lindell and Julius Honka from the Texas Stars, Dallas' top development affiliate in the American Hockey League, and placed defenseman Johnny Oduya on Injured Reserve. Lindell, 22, has tallied one assist (0-1=1), 15 hits and 14 blocked shots in 10 games with Dallas this season. He appeared in two games for Texas, posting one point (0-1=1) and a +3 plus/minus rating. The 6-foot-3, 215-pound native of Vantaa, Finland was originally selected by Dallas in the third round (74th overall) of the 2012 NHL Draft. Honka, 20, is currently tied for fourth amongst AHL defenseman with 12 points (3-9=12) in 16 games played for Texas. Amongst team leaders, he is fourth in points and first amongst defensemen. 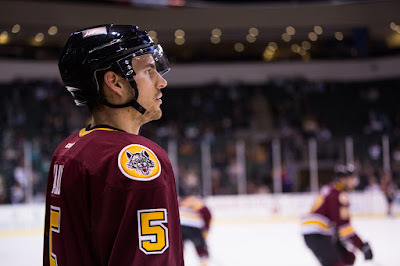 His 37 penalty minutes lead the team and are fifth-most amongst AHL defensemen. For Texas, the biggest news in tonight's game is the return of Justin Dowling. The centerman is better than a point per game in the AHL this season and has been getting decent minutes in Dallas the past week plus. His defensive skill, which is part of what got him the callup to Dallas, will assist Texas in innumerable ways. It's an especially salient point after Saturday's eight-goal shellacking. The Griffins are, as always, good. Todd Nelson and his crew in Grand Rapids are off to an 8-4 start with 2nd place in the Central Division in their possession. Starting from the net out, Jared Coreau has been the workhorse this year. He's taken 10 of the 12 games so far on the season with a .934 save percentage. His backup, Eddie Pasquale, is doing well also but isn't in the long-term plans for Detroit. Therefore, he has just two games played but sports a .925 save percentage. Equally stellar goalie play points to the group in front of them as a factor. Robbie Russo, who led the league in plus-minus last year, has returned and has six points in 12 games. Veterans Nathan Paetsch and Brian Lashoff also form a core for the group. Rookie D Joe Hicketts, an undrafted free agent pickup for Detroit, has a goal and three assists in his short opening stint in the AHL. Up front, big time prospect Anthony Mantha is tied with second-year center Matt Lorito and vet Mitch Callahan for the scoring lead with 10 points each. Former Rampage forward Ben Street and Martin Frk are also among the recognizable names. 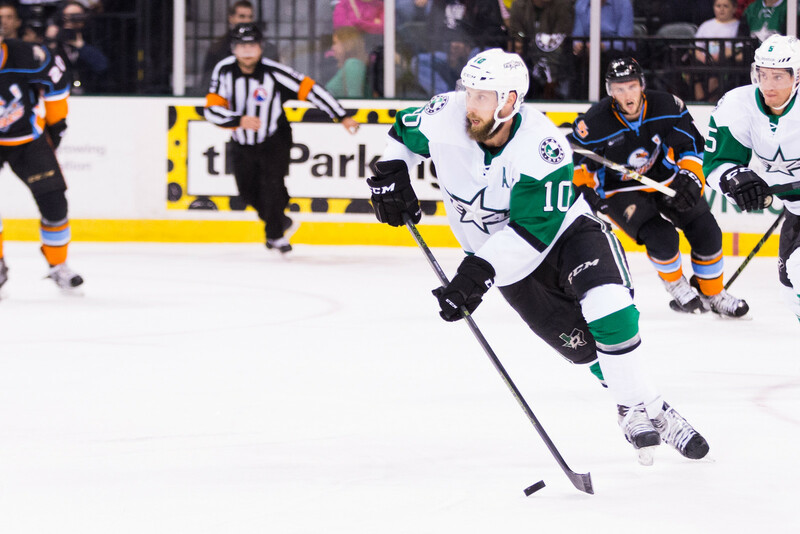 The Stars need to tighten up their penalty minute situation, which handed the Barracuda nine opprtunities on Saturday. Grand Rapids is top 10 in the league on the power play (20.8%). 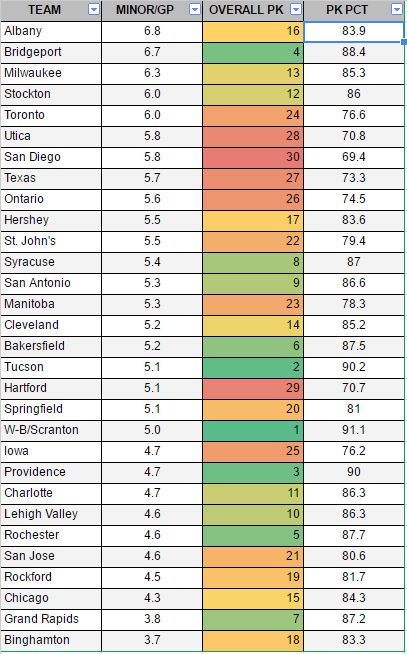 Texas ranks one spot ahead in ninth but with the same rounded percentage. On the PK, Texas is the fourth-worst club in the league at 73.5%. The Griffins are fully 14 points better at 87% and 6th in the league. UPDATE: With Brendan Ranford and Jason Dickinson back in the lineup, Caleb Herbert has been assigned to the ECHL's Idaho Steelheads. Last night's third period fireworks vaulted Texas over San Jose in the game over Stockton in the standings to put them in second place in the division. After a sub-.500 start to the year, it's a fantastic recovery that has seen them win five of their last six games. They'll look to keep their winning ways tonight with a rematch against San Jose. Rather bizarrely, this is the final game of the season for San Jose in Cedar Park. 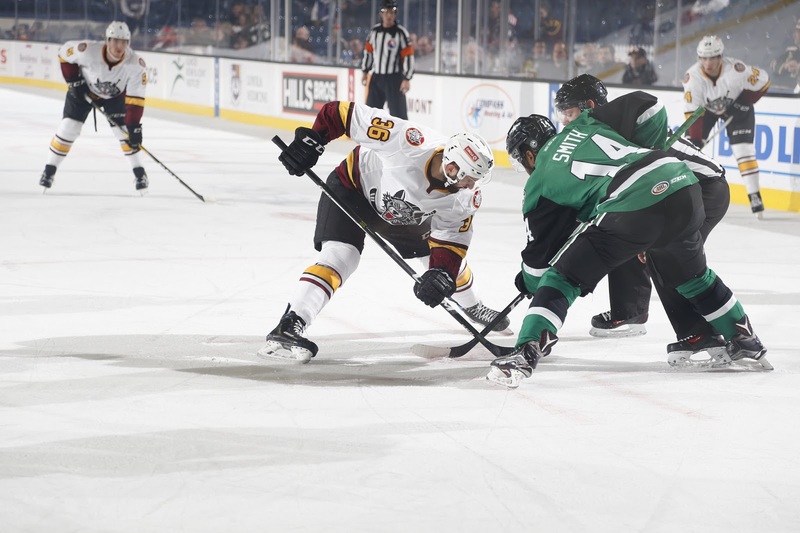 When Tucson joined the division, the league took games from the other divisional foes (except San Antonio) to make room in the schedule for the Roadrunners. Texas will play the Barracuda tonight at home and the series will finish with a two game set in late February/early March. With the completion of tonight's game, the H-E-B Center has seen the curtain close on Ontario and San Jose's visits to central Texas. I would expect Philippe Desrosiers in net for the Stars tonight as they continue their goalie rotation. 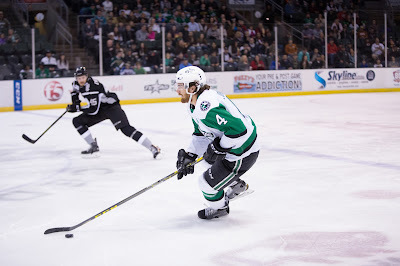 Lagace played well last night but Barclay Goodrow had his number, netting a hat trick. 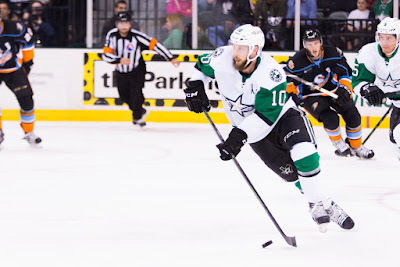 After picking up four of six points on their road trip, Texas returns home after a long layoff to play the San Jose Barracuda. It is the first matchup of the year between these two clubs. Last season, the teams split the series at 3-3 with each winning twice on its home ice and once on the road. San Jose is just behind the Stars in the standings but that may be deceiving. The Barracuda, being part of the California teams, has only played six games so far and is just one game above .500. Their resume is a confusing mish-mash of results right now as they lost a tight one to top-tier Stockton but also to San Antonio while shutting out Bakersfield. The tale of the tape is hard to read when there isn't that much tape. New faces lead in net for the Barracuda since last season with Troy Grosenick and Mantas Armalis manning the net. 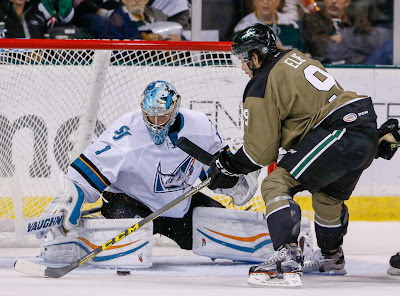 Last year's workhorse, former Allen American Aaron Dell earned his spot as the NHL backup for the Sharks. Grosenick was Dell's back in the AHL last year and is splitting duty with Armalis. Armalis is a 24-year old undrafted Lithuanian goalie that played his last two season in the SHL. They are both sporting league-average save percentages at the moment, perhaps leading to the even split. The skaters for San Jose include familiar names like Nikolay Goldobin (2-8=10 in 6 GP) and Barclay Goodrow (2-0=2 in 6 GP). However, rookie also lead the way. Among top active scorers for the Barracuda, Daniel O'Regan (4-1=5) and Rourke Chartier (3-2=5) are both first-year AHLers. Both were fifth-round picks of the Sharks with O'Regan drafted out of the US development program and Chartier in the WHL. If they can keep up their scoring ways, those late-round picks will absolutely prove some intelligent scouting by the organization. The tape for Texasis a little longer with 11 games under their belt. The road trip was a mixed bag with two good wins but a tough loss on Saturday. 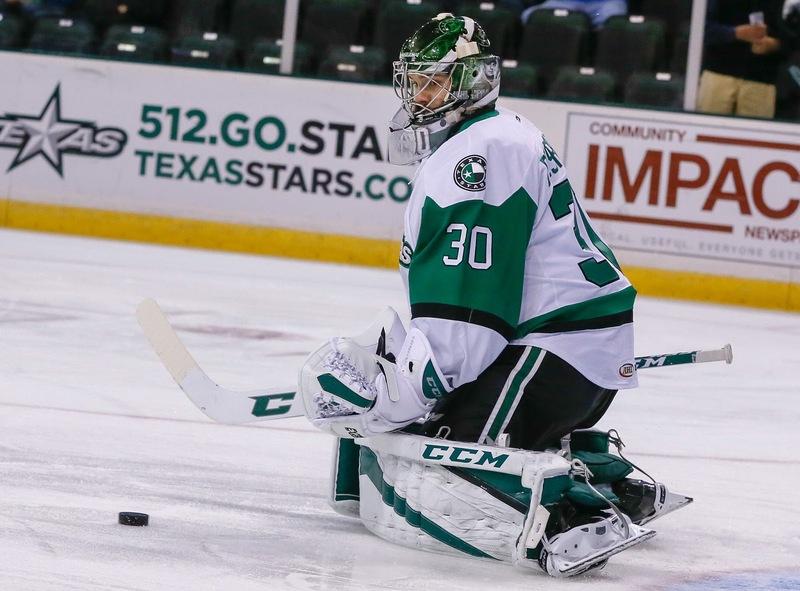 The trip did little to dispel any concern about who is the starter for the Stars in net. Maxime Lagace is carrying a 3.79 GAA and a 4-3-1 record. Desrosiers has a GAA about a goal lower at 2.73 but nearly the same save percentage. It seemed after the last home game that Desrosiers had distinguished himself, but now it's an open question. Watch what happens this weekend, as each one will likely get a start. Jason Dickinson will make his home debut as well. 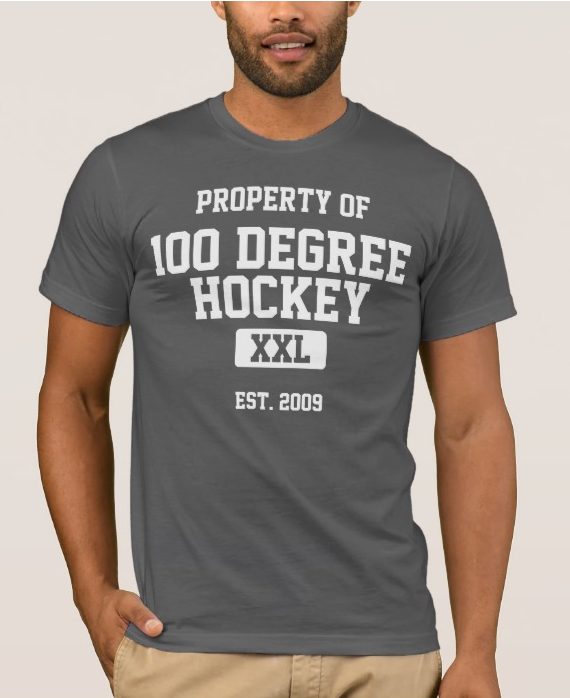 Considering that Justin Dowling is now in Dallas, Texas needs that to shore up their center depth. Texas got goals from Austin Fyten, Cole Ully and Nick Ebert, but goaltending was an issue as they fell 5-3 in Bakersfield. Maxime Lagace got the start but only stopped 11 of 15 shots, putting Texas in a 4-1 hole halfway through the game. Texas only allowed 5 shots the rest of the game with Philippe Desrosiers in the net. The Bakersfield Condors opened up a 4-1 lead and never looked back in a 5-3 win over the Texas Stars on Saturday night in front of 4,122 in attendance at Rabobank Arena. The Stars (6-4-1-0) saw their four-game win streak come to a close in the loss. It was also Bakersfield’s first win over Texas since Feb. 24, 2015, when they competed as the Oklahoma City Barons. Ethan Werek (assist) and Austin Fyten (goal) each extended their point streaks to three games for the Stars. Ryan Hamilton led the Condors (4-4-0-0) with two goals. Texas returns home on Friday at 7:30 p.m. CST to host the San Jose Barracuda in the first of a two-game weekend at H-E-B Center. The Condors took control of the game with three goals in period two to open up a 4-1 lead. Kris Newbury tipped home his third of the season just 96 seconds into the middle frame make it a 2-0 score favoring Bakersfield. Fyten answered back for Texas two minutes later after deflecting Julius Honka’s point shot for his third of the season, but the Condors added two more. Mitch Moroz tallied his first of the season at 6:12 and Hamilton slipped home a breakaway goal at 9:01. Texas tried to chip away at the Condor lead with a Cole Ully one-timer goal at 1:36 of the third, Hamilton added his second of the night on an odd-man rush at 9:03 to make it a 5-2 score. Texas defenseman Nick Ebert tipped Andrew Bodnarchuk’s shot from the point late in the game to cap the scoring. Maxime Lagace stopped 11 of 15 shots, and suffered the loss, before being relieved by Phil Desrosiers midway through the second. Desrosiers finished four of five in net for Texas. Nick Ellis earned the win stopping 29 of 32 shots. Taylor Beck opened the scoring 7:09 into the contest with a power play goal from the top of the slot for Bakersfield. Texas was 0-for-3 on the power play. Bakersfield finished 1-for-4. The Stars continue their road trip in Bakersfield. The Condors, affiliate of the Oilers, are on a win streak after dropping three straight. Their most recent win was a crushing blow against the Rampage, 7-1. Familiar faces dot the lineup for the Condors, including Laurent Brossoit in net, Jujhar Khaira, Ryan Hamilton, and Taylor Beck up front, and Jordan Oesterle and David Musil in back. On the Stars' side, they've gotten offense from a potentially unexpected place. Matej Stransky has been the engine to the offense on more nights than not for Texas. He is currently tied for 3rd in the league in goals scored and is riding a four-game goal streak. He's also on a six-game point streak. One item to watch here is whether Philippe Desrosiers or Maxime Lagace will get the start. Desrosiers has backstopped Texas to their last two wins, both in overtime. Given that he already played one on the trip and the Stars play again tomorrow, Lagace will play in one of these two games. However, the fact that Desrosiers got the third game in the desert speaks volumes about his current status on the team. There was another game on at the same time as this one, so this is a limited report. Jason Dickinson made the most of his first game of the season, notching the overtime winner in the desert to give Texas a 4-3 win over the Tucson Roadrunners in the first game between the two teams. Dickinson, who had missed training camp and the start of the season recovering from offseason surgery, tallied off the assist of Remi Elie just under four minutes into overtime. The game was a seesaw battle that had 3 lead changes. Tucson scored first but Texas charged back with two goals in 12 seconds from Matej Stransky and Ethan Werek. The Roadrunners answered with two vet goals from Jamie McBain and Chris Mueller. Rookie Mike McMurtry scored his first professional goal to end the second. A scoreless third sent things to OT. The Stars started Philippe Desrosiers in net, who stopped 19 of 22 shots against. For the first time ever, Texas plays Tucson. 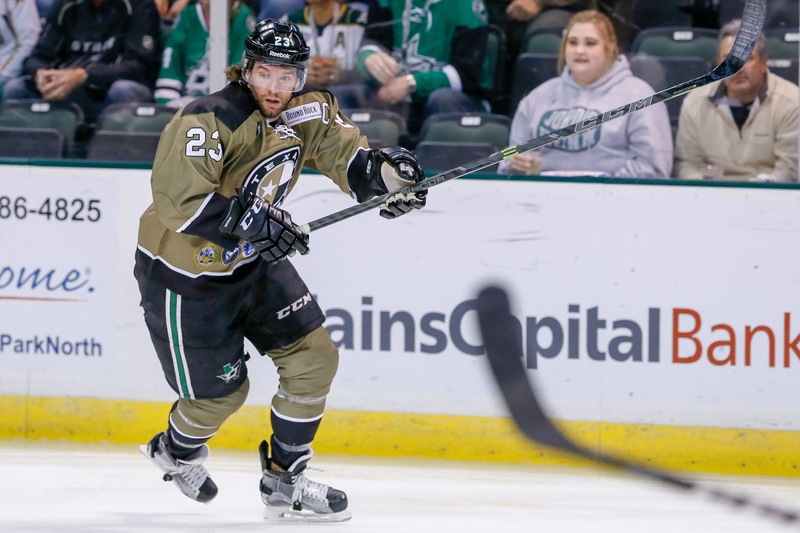 Their first contest will happen in Arizona, another first for the Texas Stars. The Roadrunners are having a good start to their first season in the AHL. To refresh the collective memory, the Roadrunners joined the league after the Springfield Falcons were purchased by the Arizona Coyotes and moved to the desert. Springfield was backfilled by the Portland Pirates. 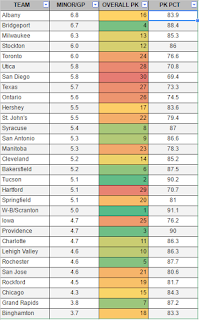 The Roadrunners are one of those West Coast clubs that doesn't play as many games as the rest of the league. Tucson and Glendale are separated by just two hours of highway. They're not abusing that advantage as much as say, San Diego, but they'll surely do it at some point. Leading the way for the Roadrunners are rookies. Center Christian Dvorak, who just won the Memorial Cup with London last season and racked up 230 points over two seasons, was just assigned to the AHL after a brief stint in the NHL. Kyle Wood, who was drafted in the third round, just won the AHL's Rookie of the Month honors for October with 2-6=8. Rookie Brendan Perlini and Ryan MacInnis (son of Al) make it three rookies in the top five of scoring for the team. Other talent includes Jarred Tinordi, son of Mark, who was acquired from Montreal as part of that infamous John Scott trade. The rest of the top five is veteran talent, some familiar and some not. Chris Mueller, of course, is well-known to the Stars. The free agent for hire is always good for a boatload of points and seems to have found his place in the less-strenuous 68-game schedule. Craig Cunningham, a fifth year player who has been in the Eastern Conference until this year, is good for at least 40 points per year. Another veteran of note is on the backend, Zbynek Michalek. The long-time Coyote is in the AHL now and can provide that defensive defenseman lockdown vibe to a young squad. In net, a rookie leads the way after Justin Peters was recalled to Arizona. Adin Hill has a 3.00 GAA and .913 SV%. He hasn't needed to be spectacular because the Roadrunners can score. Also, they're on a roll, having lost their first game and won every game since, a streak of four. 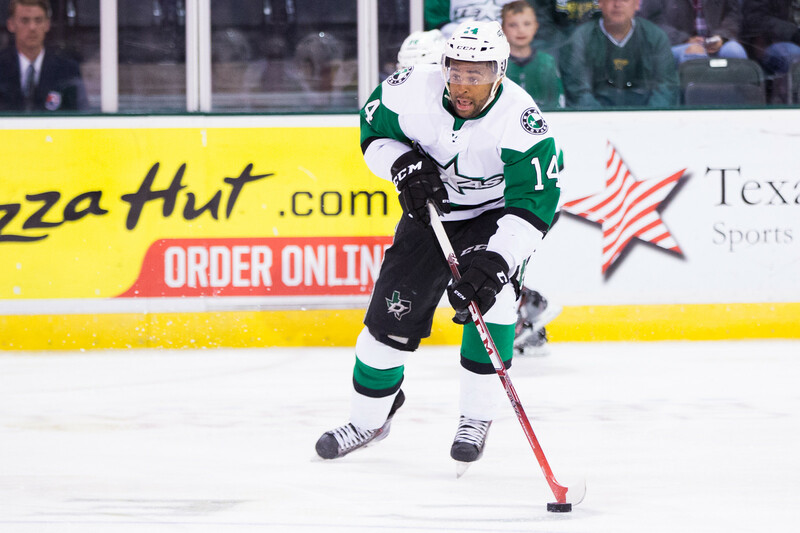 On the Stars' side, the forward corps will be bolstered by the return of Jason Dickinson to the lineup. The sophomore forward missed all of training camp and the start of the season recovering from surgery. This will be his first game action of the season. Texas has a decision to make in net as well. There are three games on the trip in four days, so both goalies will get a chance. However, is it two for Desrosiers or Lagace? Last weekend's shutdown effort from 'Phil' may change the answer to that question.